Here we have a guest blogger, Vickie Oddino. Her sharp eye caught unique aspects of our trip to Greece and Italy, which I wanted to share with you in her words and pictures. I took a ferry from Mykonos to Athens in order to meet the group I would be traveling with for the next two weeks. This was a once in a lifetime opportunity, as my friend Marsha Enright had organized a group to study the classics while we visited the places where their writers lived and worked. So we read Plato and Aristotle and Homer and Sappho and many others. First stop: Athens. The ferry docked in Piraeus, and I had to catch the train to the hotel in Athens. Athens was a shock to the system after Santorini and Mykonos! Every surface is covered with graffiti. Upon first glance, the trains, which I had heard were relatively new, had also succumbed to the taggers. But closer inspection revealed that they had been produced covered in graffiti, I guess to beat them to the punch. But when I came out from the underground station, I was assaulted with trash, traffic, vendors, homeless, ruins, graffiti, noise. The contrast was jarring. Hotel Astor provided fantastic views of the Acropolis, which we visited. We also went to the Acropolis Museum (built over the ruins of a town, using glass floors to see the excavation), Plato's Academy, Aristotle's Lyceum. We drank ouzo, got caught in a torrential rainstorm, and shared our thoughts on the readings. We also explored the narrow streets, the plazas, the shops, and the restaurants. We were only there a few days, but by the time we left, I had grown accustomed to the pace and the feel of the city. But we had to move on. Next stop: Lesvos! In Athens, I browsed the souvenir shop while a couple friends picked out statues of Venus and Aristotle to buy. One of the men who worked at the store asked where we were from and where we were headed next. “We’re leaving for Lesvos tomorrow,” I told him. He stared at me. “Lesvos?” he asked. “No tourists go to Lesvos.” Well, we aren’t normal tourists, we explained. He was certain we must be going to visit the famous monastery. Nope, that wasn’t on our schedule (although it was pointed out when we drove by it). We were going mostly because it was the home of Sappho. Plus there were museums and archaeological sites there as well. He was so impressed to hear we were going there, he tried to convey just how beautiful the island is. Honestly, he didn’t do it justice. One of the best parts of this trip was that I had an opportunity to visit places that I never would have chosen to go on my own. One of those places was Lesvos. And when we walked through the streets of one of its famous town, Erressos and I saw a sign for a room for rent, I fantasized about getting that room and living there for six months and writing. We had lunch, some went swimming (I just dipped my toes in the water), and wandered. Erressos was the home of Sappho, a poet I had not read before but now one of my favorites. The town hosts a collection of statues of Sappho. I unfortunately missed most of them - not sure how I managed that. But absolutely loved the town. One night we drove to Molyvos in hopes of seeing the sunset over the Aegean Sea. Got there a bit late, but the Molyvos Castle was waiting for us. We explored the grounds and then headed down a mountainside to meet up with our bus. We needed to walk through the town built right on that hill side. I didn’t get many photos, and I certainly did not get any photos that could even remotely capture the place because it was late at night and very dark. But the town was one of my favorite places (I probably say that too much!). We walked down narrow cobblestone pathways with little shops and cafes lining each side. Overhead were vines that had climbed up the walls and then over the top of us to the wall across the path, creating almost a tunnel. I felt like I was in Harry Potter world. I don’t know why, but the place matched the picture I had in my head when reading the books, which doesn’t match the movies. I only wish we could have been there during the day! Another stop we made was at an olive press museum. Strangely enough, the electricity went off early in our tour. So in the dark, we finished learning how olives are turned into olive oil. We also spent our last night on Lesvos in Mytilene, in a hotel on the water. The country of Turkey was visible from many parts of the island, only ten miles away in some parts. It turns out Lesvos is a huge refugee port, many coming by way of Turkey. That explained the coast guard ships lining the port. Some of the group thought about going to visit the refugee camp on Lesvos - a huge camp that serves as a gateway to Europe. Had we contacted the “authorities” ahead of time, we could have gone, but without that, the doors were closed. But the best part was that Mari and I had the best room in the hotel. We had a balcony that wrapped around the corner of the building, overlooking the water. It was amazing. So amazing that we had to invite friend over to share. So we discussed Paul's "Letter to the Corinthians" with Sable and Noelle, we enjoyed thunder and lightning, and we drank wine. Fantastic. Another favorite was when three of us, Mari, Bob, and I, were trying to find the rest of the crew who had gone to a restaurant called “Home” for dinner. The good news was we had an opportunity to really explore the town. We wandered around asking how to get “home,” without any luck. We stumbled upon a commotion in what I could only call an alley. Turned out, there was a group of drummers, playing various types of drums, making music while crowds of people danced to the beats. We joined in the dance to the tribal beats, to the unexpected party we found. Sometimes, a car would show up and want to squeeze down the street. And when there was a break in the beats, everyone would push back against the buildings and navigate the car through the crowd. At the end of the night, who cared that we didn’t find “Home.” We found something better! A street in the lovely town of Napflion, near Argos. Mainland Greece! We drove from Athens to the Peloponnese, where we spent the next four days. Each town was better than than the previous. Every place was so unique and so full of history. To get to our first stop, Ancient Corinthian Heights, we had to cross the very deep Corinth Canal. Before we visited the archeological site and the museum, a group of us had lunch on a rooftop overlooking the ruins surrounding the Temple of Apollo. I should mention that most meals in Greece included not only liters of wine, but lots of Ouzo too, which I grew to actually enjoy! My favorite food ended up being tomato and cucumber said, which I found myself ordering often. (The Greek salads, of course, were good too.). I ordered other standard Greek dishes, such a gyros and souvlaki, but the meat was fairly inconsistent. The vegetables, however, weren't, the were delicious. I pretty much stayed away from the seafood, but a lot of others enjoyed octopus, kalamari, cuttlefish, sardines, sea-bream. Much of the fish was salty and served whole, filled with bones and sometimes teeth - eek! Oh, and of course gelato! But the really strange thing is that many of the gelato shops gave a choice of putting it in a cup, on a cone, or in a bun. Yep, a bun - so weird. Called Brioche Con Gelato, and it looked like the gelato was served on a hamburger bun. I tried of bite of someone else’s but stuck to ordering in a cup for me. That first night was spent in Loutraki, in a little hotel right across the street from the beach. Most people walked to the middle of town for dinner, but Mari and I decided to enjoy a glass of wine on a love seat facing the water at a cute little restaurant. It was beautiful and relaxing. The next day, we visited Tiryns, a Mycenaean archaeological site in Argolis, where we saw a corralled arch tunnel, a beehive tomb, and the headless lions gate. Another adorable little town we stopped in was Nafplion, a town on the sea with plenty of little restaurants and cafes and shopping. Quite a few people named this town as their favorite, so we made sure to go there a couple of times. Mari and Marsha and I had lunch at a little cafe with seats at a counter out on the sidewalk. I think our lunch cost 2 euro each. I was so surprised how inexpensive everything was in Greece. I was concerned about the exchange rate, but it turned out it didn’t matter! We spent the night in a beach village called Tolo (or Tolon). I really loved this town. Our hotel was right one the water of a long thin beach. The bus dropped us off in a lot at one end of the beach. We unloaded our suitcases and had to roll them down the beach on the sand to our hotel. We stepped right off the sand into the lobby - just beautiful. That night was girls night out! One of the best nights. Mari, Marsha. Liz and I walked a bit further down and found a place with tables on the beach. The water literally lapped at our feet. Sable and Noelle soon joined us. A night of lots of laughs and lots of wine, thanks to other tables in the restaurant buying us liters of wine! A couple of other spots we visited included Agia foteini, a strange building/church in Mantinea. Another of my favorite places was Olympia, for a few reasons. One was because I really enjoyed the archaeological site. Something about the ruins was particularly beautiful: the wildflowers and greenery growing among the destroyed buildings, the huge columns knocked over during n ancient earthquake, revealing the separate chunks. Another was the visit to the stadium and watching friends race the 200-meter track. I also enjoyed really letting the place come alive in my imagination - the foundational remains of the statues of the cheaters, the tributes to ancient Olympic winners, the spectacle, the training. Finally, although we visited the Museum of Ancient Olympic Games, which was really interesting, Olympia was home to my favorite museum of the trip, The Archaeological Museum of Olympia. This was one of the most beautiful museums I’ve been to. Just the way that the archaeological pieces were displayed was gorgeous. I remember taking a bunch of photos of some of the pieces, but I cannot find them! It is the weirdest thing, and I am so frustrated about that! Maybe I’ll be able to find them at some point…but at least there's this one of Hermes protecting the baby Dionysus. I swear I also took photos of both the East and West pediments of the Temple of Zeus, which included only original pieces. Ugh. Powerful presentation. Oh well. I did find my photo of the statue of Hermes made by Praxiteles. One of the best nights we had as a group was the night we went to a working olive farm. Such a fun, fun night. We got a tour of the farm, a lecture/presentation of how olives become olive oil, enjoyed a fantastic dinner with local wine and olives and olive oil. And then after watching some traditional Greek dancing, joined in the dancing ourselves. It was a great night! We flew from Athens to Catania, Sicily. But first we stopped at Taormina Beach for a day. Mari and I found a set of lounge chairs and umbrellas and parked ourselves there for a couple of hours, to relax in the sun. At the appointed bus meeting time, we gathered our things, but first we found a little cafe to have a quick beer before leaving. As others walked by on their way to the bus, they stopped and joined us for the few minutes we had left before we needed to be back. Once at the bus, texts started coming in from half of the group - they were still quite a bit away and had to catch a taxi. One thing you quickly learn traveling with a group of people is that someone, or some few, are always late! And this had happened a lot! This time, we were not going to let the time go unused, so a group of us ran back to a little shop and bought as many beers as we could carry and had cash for. We brought them back to the bus and enjoyed bottles of Morelli beer, which soon became an Italian staple for me, while we waited. Then we checked into our Catania hotel, Hotel Valentino, a very old building that sadly lacked an elevator. Luckily, there are still gentlemen in this world who were able to help with luggage up to the second floor (thanks Scott!). But the room! The arched ceilings, painted with carved figurines, must have stretched twenty feet high. Magnificent! Although on our first night, we couldn’t help noticing the crowd noises out on the street that lasted late into the night. Turned out, not only was our hotel in the middle of the historic district of Catania, but it was next door to an all night strip joint. Always another adventure! We had two goals while in Sicily - one to see the Riace Bronzes and the other to visit Syracuse. The trip to the Museo Nazionale della Magna Grecia in Reggio Calabria to see the bronzes took two hours from Catania, and although that may seem like a long drive to see a couple of statues, it was absolutely (and frankly, unexpectedly!) worth it. We had been to countless museums on this trip, but what I really enjoyed about this one was that it included artifacts from as long ago as 300,000 years ago. I truly cannot wrap my head around the fact that humans were creating art and pottery and tools that long ago. But the Riace Bronzes? I turned a corner and was ushered into a set of doors, which quickly closed behind me. I was with only a couple of other people in a small closed room. A red light turned on and a humming noise started. And then we stood there. It felt like being in the room before getting on a ride like the old Back to the Future at Universal Studios where a screen lights up and sets up the scene while we wait for the doors to open to climb onto the ride. But here, we were just greeted with silence. After a couple of minutes, the opposite door opened into the room where the two bronze statues were displayed. I later learned that the anteroom was for decontamination. And the room with the bronzes was climate controlled. When the few of us sharing the decontamination room entered, no one save a security guard was in the room. The impact of the silence, the emptiness, and the two full-sized bronze warriors hit me with an awe I didn’t expect. I had to choke back tears. It’s a reaction I don’t understand, but others said they had a similar reaction. The story we were told is that the two statues were discovered in 1972 by a snorkeler who saw a hand reaching up from under the sand at the bottom of the sea. It turned out he discovered perfectly preserved ancient Greek bronze statues dating from the fifth century BC. The next day was spent in Syracuse. We first visited the Parco Archeologico della Neapolis, an archaeological site, where we saw the large limestone cave known as the Ear of Dionysius and ruins, including a Roman amphitheater used for gladiator fights. The Ear of Dionysus - a hole that allowed the Syracusan dictator to listen into the plans of captured Roman soldiers. The man in the picture is singing softly into the hole and everyone in the cave could hear it. Next we walked crossed a bridge to the Island of Ortygia. Our first stop was lunch, after walking through a large market with fresh olives, pistachios, and herbs for sale. I saw a tomato mozzarella salad on the menu where we stopped to eat, and promptly ordered it. That was my last salad in Italy. It was no match to salads in Greece. After lunch, we wandered the cute little island, seeing the remains of the Temple of Apollo sitting between more modern buildings (or a least more modern for Italy) and standing in the shadow of the massive Cathedral of Syracuse. We also visited a really unique place, the Museum of Leonardo Da Vinci and Archimedes. The museum displayed physical constructions based on the drawings and inventions of Da Vinci and Archimedes. It was a hands on place, where visitors can work the pulleys, levers and other machines. We certainly did not have enough time in Italy. But I was not yet done with my trip, as I had a flight the next morning at 6 AM to Milan, where I would meet my friend Dawn for two weeks in Italy! Woo hoo!! Ah. The people! Yes, the sites were amazing, but it was the people who really made the trip and made the experience unforgettable. Thanks to Marsha Enright for the incredible work she did to put together this two-week adventure to Greece and Sicily. What brought us together was an interest in ideas and an interest in discussing ideas with others. So we came to study the ancient Greeks while immersing ourselves in the worlds that they inhabited. Marsha Enright at Catania cafe. 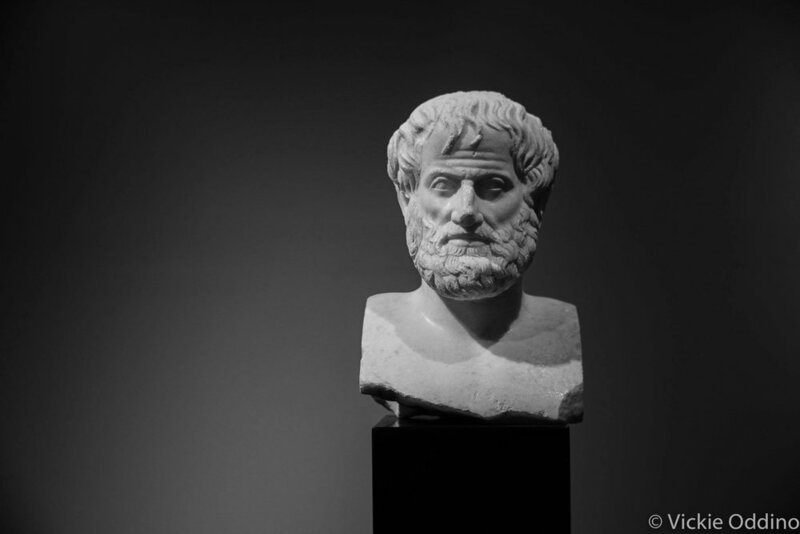 We read Aristotle, Plato, Homer, Hesiod, Aristophanes, and Sappho, among others. And we met in basements, breakfast rooms, conference rooms, hotel lobbies, and even poolside, with annotated readings in hand, to discuss the meanings of the texts and the influence the ideas have had on today’s world. For example, we read Aristotle’s “Parts of Animals” and visited Aristotle’s Lagoon, on the Gulf of Kalloni where he spent time studying animals. We read Sappho’s poems and visited Eressus, which lays claim to her and where she is most celebrated. But we certainly did a lot more than read and discuss and learn. We broke bread. And salads and fish and souvlaki and gyros and pasta. And we drank liters and liters of wine. And ouzo and shots and beer. And more wine. We danced. We ran in the rain, and we splashed in the puddles. We laughed. We corrected and challenged our guides. We enjoyed the beaches. We shopped for miniature statues and for phallic bottle openers. We argued. We heard from Greeks who are fighting to bring economic literacy to the people of the country to help turn things around there. We wandered through ruins thousands of years old. We shared stories of ourselves. We explored back streets and discovered bars and restaurants off the beaten track. We shopped in outdoor markets. We posed for photos. We rode across the countrysides of Greece and Sicily on buses. We panicked when our plane aborted its landing. We applauded impromptu performances at the the Ancient Theater of Epidaurus. We befriended cats. Ian, Matt, and Bill racing on the Olympic track. We raced in the Ancient Stadium of Olympia (ok, some of us raced while others cheered them on). We listened. We inadvertently threw toilet paper in Greek toilets despite the signs in every restroom instructing us not to, and we rejoiced when we got to Italy and that was no longer a rule. We tried new foods. We dragged suitcases through airports, through sand, up stairs, and into teeny tiny elevators. Most importantly, we became friends. I am so grateful I was able to share this once-in-a-lifetime experience with this particular group of people.